a) Compare the ways these works suggest expression. Lang Kacang and Second Beak Head are both very expressive sculptures as both the subject matter(which is the sculpture itself and the content) have their faces contorted in emotion. Both are showing their frustration and anger in their facial expressions. Their anguish, frustration and pain is conveyed to the viewers through their facial features. For Lang Kacang, the sculpture's mouth is wide open and is giving out a roar of frustration and anger, with his head really thrown back and we can tell from the intensity of his roar, that he is really frustrated. For Second Beak Head, the sculpture's mouth is closed and he is pouting. The intensity of his frustration and anger is not as intense as Lang Kacang as he is somewhat keeping his anguish inside himself, and not letting his emotions explode out by roaring, unlike Lang Kacang, whose emotions are revealed in the intensified roar, with his mouth wide open. For Lang Kacang, even though his facial expression is contorted with pain and anguish, his torso stands stiff, rigid and somewhat emotionless, bounded by the bandages of metal which somewhat restricts movement as it is so stiff and solid. So through his body language, the viewers cannot really tell that he is angry unless they look at his face. So just by looking at his body, the emotions of anger and frustration are not conveyed. We can only experience the mood portrayed by the sculpture when we look at the face. 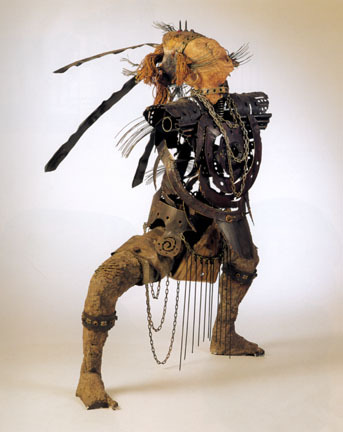 Whereas for the Second Bead Head,his emotions are not only shown in his face, but also in his neck. In his neck, the veins are protruding distinctively, which shows his immense frustration. His veins are popping out so much that we can sense that he is somewhat holding all his anger inside(since he is not roaring out his frustration) and his emotions are torturing him from the inside. For Lang Kacang, the figure's whole body is portrayed. His legs are in an awkward position, which may suggest the intensity of his roar as his roar is so intensified that he seems to be losing his balance as he concentrates all his emotions into that powerful roar, letting all out. The inclusion of the legs also let us know that he is roaring so hard that it is hard to care about how he is standing. The whole sculture is also quite distorted. For Second Beak Head, only the top part of his body, with the head and showing some of his chest, is shown in the sculpture. So we do not exactly get how the body is positioned, unlike Lang Kacang, where we can see the full body. We can only rely on what we see in the sculpture to deduce the mood the artist is trying to convey through his sculpture. b) How do the artists differ in their treatment of the surface of their work in both sculptures? Both Lang Kacang and Second Beak Head are three-dimensional sculptures. Both have smooth surfaces, but the Second Beak Head does not have the rough and uneven surfaces that are present in Lang Kacang. In Lang Kacang, a variety of surface textures are present. For example, the head and the body have different textura;l surfaces. For the face, we get the impression that it has a rough and crude texture. Since there are many different objcts adorned on its head, a variety of texture in the different surfaces are created. For example, the crown base and the feathers may be smoother(as they are made of metal) compared to the rest of the headpiece, which seems to have a more 3-dimensional effect. The gems placed on the crown also suggests an unbalanced texture on the crown as a whole. Moving on to the body, the metal torso may be mostly smooth, however, with little protrusions here and there, it disrupts the whole harmony of the metal pieces being put together. The torso is actually quite hollow in the sense that the streaks of metaaal which combine to form the torso are not uniformly placed beside each other. Instead, they are curving in a non-uniform dierection, allowing the viewers to see through the hollow gaps that are not covered by the metal, so the surface is somewhat disrupted by these hollow gaps. The legs have a rough surface as suggested in the unbalanced texture of the surface. Moreover, Lang Kacang has a huge a variety of surface textures as different materials are used to put the sculpture together, so it does not have a uniform surface. However, in Second Beak Head, the surface of the sculpture is smooth and uniform throughout, with no signs of roughness in the sculpture. The surface looks glossy and polished as light can be seen reflecting off its surface, and thus, reflecting the smoothness and glossiness of sculpture itself. Since there is only 1 material used in creating the sculpture, the surface is mainly uniform throughout, with the exception of minor cracks at the side of the sculpture. The surface is handled carefully by the sculptor. He deliberately and carefully carves the sculpture, showing the clear features of the sculpture. The sculpture is carefully carved as the sculptor takes care of every detail and makes sure that he carves the surfaces smoothly and gently. Therefore, a smooth uniform surface is created. c) Which work do you think is more effective in its use of the materials for this subject? I think that Lang Kacang has a more effective use of materials compared to Second Beak Head. Lang Kacang comprises of a wide range of materials ranging from metal to chains, strings etc. Wheras for Secong Beak Head, only one material is used - Alabaster. The many materials used in Lang Kacang give the sculpture a more 3 dimensional feel to the sculpture. The different textures created by the different materials are effectively portraying the mood as there are more rough textures than smooth textures in the sculpture, contributing to the sense of anguish, emotion unstability and frustration that the sculpture is trying to portray. When someone is frustrated, it is a rough and intensified emotion, which can be effectively portrayed by rough textures. 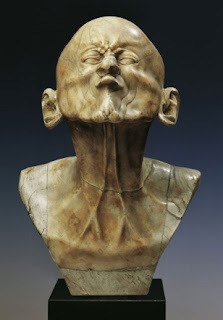 The different feel of the materials also contribute to the many emotions concentrated in the roar -- anger, frustration, thus heightening the intensity of the frustration portrayed by the sculpture. For the Second Beak Head, it is made of only one type of material, which has a smooth,gliding texture. The material is not so effective in portraying anger but instead, it is more effective in portraying calmness. There is only one material used and it does not exemplify all the angry emotions that the sculpture is trying to show. Smoothness in the surface does not bring out the crude emotions contained in the sculpture. So with more materials used in Lang Kacang, it is more effective to portray the mix of emotions of the sculpture.